The Constitution Act 1986 is an Act of the New Zealand Parliament that forms a major part of the Constitution of New Zealand. It lays down the framework defining fundamental political principles of governance and establishes the powers of the executive, legislative and judicial branches of state. It outlines the roles and duties of the Monarch, Governor-General, ministers and judges. The Act also repealed and replaced the New Zealand Constitution Act 1852 and the Statute of Westminster, and removed the ability of the British Parliament to pass laws for New Zealand with the consent of the New Zealand Parliament. After the 1984 election, there was an awkward transfer of power from the outgoing Third National government to the new Fourth Labour government in the midst of a financial crisis. Outgoing Prime Minister Sir Robert Muldoon was unwilling initially to accept instructions from the incoming Prime Minister David Lange to devalue the currency. Ministers hurriedly constructed an argument to convince Muldoon to comply, drawing on the ethos of past transitions as there was no existing convention. Eventually he relented, but only after his own party caucus had threatened to replace him. A press statement was made on June 17 outlining the behaviour of outgoing governments, which was dubbed the 'caretaker convention'. An Officials Committee on Constitutional Reform was established by the Labour Government to review New Zealand's constitutional law, and the Constitution Act resulted from two reports by this Committee. The issue of the transfer of power from outgoing to incoming governments (and hence prime ministers) was not resolved by this Act, however, and the transfer of executive powers remains an unwritten constitutional convention. The Officials Committee on Constitutional Reform reported back to Parliament during February 1986. The Committee recommended that New Zealand adopt an Act to restate various constitutional provisions in a single enactment that would replace the New Zealand Constitution Act 1852, thus "patriating" the Constitution Act to New Zealand. A Bill was introduced into Parliament during mid-1986, and was passed unanimously with the support of both the Labour and National parties on 13 December 1986. The act came into force on 1 January 1987. Amendments were passed during 1987 and 1999. The Act repealed the New Zealand Constitution Act 1852, renamed the General Assembly as the "Parliament of New Zealand" and ended the right of the Parliament of the United Kingdom to make laws for New Zealand. Section 21, covering bills appropriating public money, was repealed. Only section 17 of the Act (which says that the term of Parliament is "3 years from the day fixed for the return of the writs issued for the last preceding general election of members of the House of Representatives, and no longer") is entrenched, by section 268 of the Electoral Act 1993. This provision requires that any amendment to section 17 can only be made with a majority of three-quarters (75%) of all votes cast in Parliament, or by a referendum. However, section 268 of the Electoral Act 1993 itself is not entrenched, which means that Parliament could repeal the section itself, and amend section 17 of the Act. Thus, the provision is said to only be 'singly entrenched'. Some academics, including Sir Geoffrey Palmer, argue that the Act should be totally entrenched. The Act replaced the New Zealand Constitution Act 1852 and repealed the Statute of Westminster Adoption Act 1947 and removed the ability of the United Kingdom to pass laws for New Zealand with the consent of New Zealand's parliament. 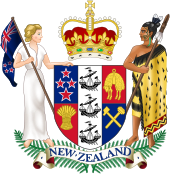 The last British Act of Parliament passed on behalf of the New Zealand Parliament was the New Zealand Constitution Amendment Act 1947. This Act was passed to allow the Parliament of New Zealand the ability to amend any part of the 1852 Act (a number of sections of the Act were unable to be amended by the Parliament of New Zealand, including provisions establishing the Parliament itself), requested by New Zealand in the New Zealand Constitution Amendment (Request and Consent) Act 1947. The British Act allowed New Zealand to amend the Constitution Act to abolish the Legislative Council, the appointed upper house of parliament originally established by the 1852 Act. ^ McLay, Jim (2012). "1984 and all that" (PDF). New Zealand Journal Of Public And International Law. 10: 267–287. ^ Reports of the Officials Committee on Constitutional Reform. Wellington: Department of Justice. February 1986. This page was last edited on 3 April 2019, at 17:03 (UTC).